I went to see 3-D Brave with my five year old daughter yesterday. Since we are both curly red haired lassies, I thought the character would be someone that my daughter and I could relate to. I also am passionate about my Celtic heritage. It would be a nice change to find something in a Disney movie we could identify with rather than simply long for: such as long blonde hair, and a great singing voice. Merida is the daughter of King Fergus and Queen Elinor of Scotland. Unlike her mother, she is only happy outdoors with her arrow and bow. Enter the conflict: Elinor thinks it is time that Merida marries (and if you haven’t seen the selection of young men that are offered, I can only tell you that I myself would demand to remain celibate). Merida attempts to outwit her parents and the clans by vying for her own hand in marriage and challenging them to a competition of archery she knows she will win. Her success only adds to the rift between her and her mother, and culminates in Merida running away into the forest. Forest spirits, or will-o-the-wisps, lead her to a witch who gives the young lass a potion that will change her mother. Merida believes that it will change her mind towards a forthcoming marriage. The reality is that it will physically transform her mother into a bear. What follows is a humourous and touching journey to reverse the spell. Did I mention that King Fergus lost his leg to a bear, and that same evil bear is still lurking in the forest of the kingdom? The shift turns at this point towards her mother’s struggle: being a bear and protecting her child. In the end her instinct to protect her child forces Elinor (the bear) to fight and defeat, the ancient evil bear (who was an ancient naughty king don’t you know, who broke the peace of the land). After this show down, Elinor returns to her human form but is transformed by her experience. 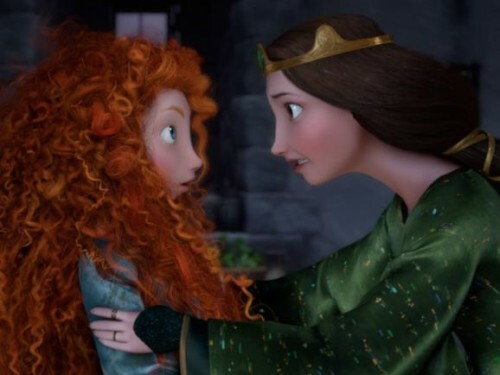 Merida doesn’t have to marry, and mother and daughter have strengthened their bond. In my minimal experience of Disney movies I see Brave breaking the usual Disney mold. We usually see a romantic relationship between characters even in the most recent of the Disney movies: Rapunzel and The Princess and the Frog. Whether they are initially looking for love or not- they find it. In most cases love is the final reward for most of the heroines of Disney. Merida is not looking for love, but simply to enjoy life. She seems like a modern version of the huntress Diana. I wonder about the choice to make her suitors so unattractive. It allows her preference of chastity to be so simple (who would want to marry those men and welcome their crazy family into your clan). It would have been an interesting choice to have her suitors attractive, and still have her dislike the idea of marriage. It would have added more complexity and certainty to Merida’s choice. Women are usually the antagonist of Disney movies: Cruella De Vil, Millicent, Snow White’s mother, Mother Gothel, And Cinderella’s step mother and sisters. In Brave, Queen Elinor starts out as the antagonist. She is the force that demands that Merida marry. Her role of antagonist ends there and she becomes a complex character through her transformation into a bear: she connects with her wild self, she fights to the death for her child (the bear fight did scare my daughter a little bit), and she realizes that tradition is less important than family. The Celtic respect for the otherworld was honoured in this movie: the sense of the otherworld through the will-o-the-wisps, the standing stones, and the anthropomorphic change in Queen Elinor. The magic we observe in this movie is tied to the land, not simply the whim of any one character. I would say that as far as Disney goes, Brave has strong female characters. A movie that would be enjoyed by mother and daughter alike- we certainly would go back. This entry was posted in Art, Film, media and tagged Brave, Celtic tradition, Disney, film, Mirda. Bookmark the permalink.